Summary and Definition: The War Industries Board (WIB) was one of the first United States government agencies established during WW1. The War Industries Board (WIB) was created on July 28, 1917 to coordinate the production of war materials and the purchase of war supplies. At first, President Woodrow Wilson was reluctant to give the War Industries Board (WIB) much authority over the economy but this changed in March 1918 when Bernard Baruch, a Wall Street stockbroker, was appointed to run it. The WIB encouraged companies to use mass-production techniques to increase efficiency and eliminate waste by the standardization of products. Woodrow Wilson was the 28th American President who served in office from March 4, 1913 to March 4, 1921. One of the important events during his presidency was the War Industries Board. The following fact sheet contains interesting facts and information on the War Industries Board (WIB) that was created during WW1. War Industries Board Fact 1: WW1 began in Europe on July 28, 1914. The United States adopted a policy of neutrality at the start of the war and did not enter conflict until April 6, 1917. War Industries Board Fact 2: The War Industries Board (WIB) was a government agency that was created on July 28, 1917 during World War 1. 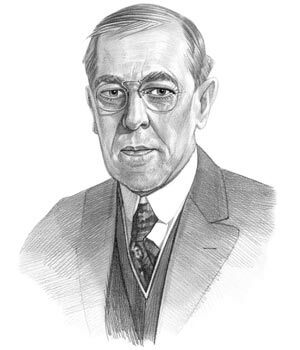 War Industries Board Fact 4: President Woodrow Wilson was reluctant to give the WIB much authority over the economy but this changed in March 1918 when it was realized that war industries needed to become more efficient. War Industries Board Fact 5: Bernard Baruch, a Wall Street stockbroker, was appointed to run the WIB. War Industries Board Fact 6: Bernard M. Baruch (1870–1965) was a wealthy Wall Street broker who had supported Woodrow Wilson's presidential campaign and served as an economic adviser during World War I (1914–1918). War Industries Board Fact 7: The WIB consisted of a number of different divisions that included responsibility for prioritizing the use of raw materials, conservation and regulating prices. The fact sheet continues with interesting facts and information on the War Industries Board (WIB) that was created during WW1. War Industries Board Fact 8: Under the supervision of Bernard M. Baruch , the WIB controlled the flow of raw materials, told manufacturers what they could and could not produce, authorized the construction of new factories and with the president’s approval, set prices. War Industries Board Fact 9: While the WIB was in place, industrial production in the US increased by an estimated 20%. War Industries Board Fact 10: The WIB applied price controls at the wholesale level but retail prices soared. In 1918 Americans were paying almost double what they had paid before the war. War Industries Board Fact 11: Corporate profits soared in industries such as steel, oil, chemicals and meatpacking. War Industries Board Fact 12: Other US Government agencies were created during WW1 to regulate the economy and special boards were established to encourage cooperation between the government and big business. ensuring efficient use of national resources to further the war effort. The Federal Mobilization Agencies were established to compliment the work of the WIB and WW1 Mobilization. War Industries Board Fact 13:The WIB achieved greater economic efficiency through the rationalization of industrial practices. War Industries Board Fact 14:World War 1 ended on 11 November 1918 and the WIB was terminated by executive order on 1 January 1919. The article on the War Industries Board provides detailed facts and a summary of one of the important events during his presidential term in office. The following Woodrow Wilson video will give you additional important facts and dates about the political events experienced by the 28th American President whose presidency spanned from March 4, 1913 to March 4, 1921.